Special Forum – at 7:00 p.m. Reception and food/snacks at 6:00 p.m.
Gilad is the ex-Israeli that the gate-keepers are scared of talking to or about. Gilad Atzmon rarely thinks inside the box. Many consider his ideas offensive, but Gilad would ask, "Are they wrong?" This is, of course, the right question. Gilad thinks he has achieved some breakthroughs that he has not yet published and that he would like to share with you. According to him, they help to answer questions like why the Palestinian liberation movement and the Palestine solidarity movements have been held back and thus far unable to achieve their goals, but the implications are much wider. 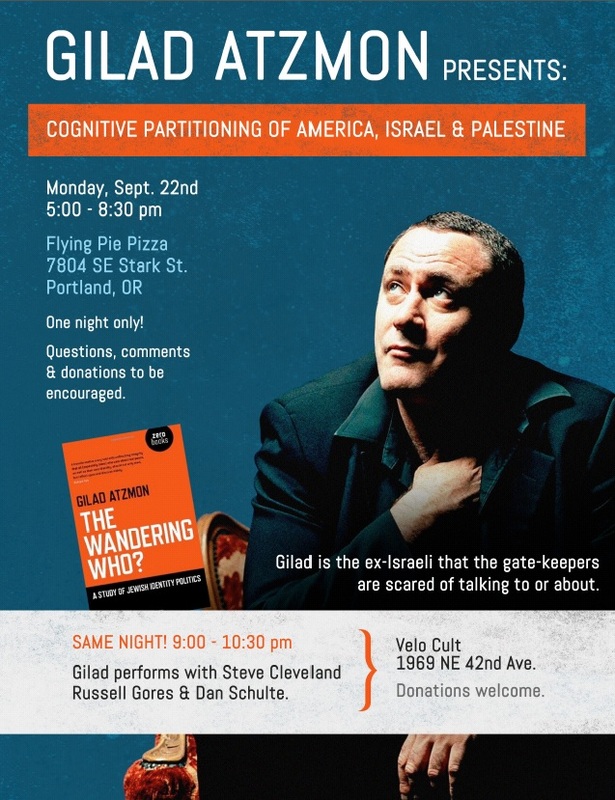 Gilad's talk and discussion will be held on Tuesday, Sept. 23, 7:00-9:00 p.m. in a private residence in Berkeley. If you wish to attend, please respond to larudee@pacbell.net or 510-236-5338. We ask you not post to lists, but if you wish to share with interested individuals, please do so. Stop the Palestinian Genocide: A Discussion on Tactics and Strategies for Supporters of Palestine With Author/Jazz Artist Gilad Atzmon. Jazz Jam by Gilad Atzmon with artist Donavan Mixon following the discussion. Northeastern Illinois University Recital Hall, Fine Arts Center Recital Hall. 3701 W. Bryn Mawr Ave. Chicago, IL 60625. Gilad Atzmon is coming from London for a unique session at Zeb’s studio, Manhattan, NYC. You will be experiencing Gilad’s collaboration with three of NYC’s finest musicians: Ben Meigners on upright bass, Jason Brown on the drums and Saul Rubin on Guitar. new, interesting development of artistic dialogue between NYC based pianist Amina Figarova, originally from Azerbaijan, and saxophone player Gilad Atzmon began a few years ago in Luxembourg leading to concert tours in the UK and the US. The duo performs jazz standards as well as original compositions in musical exploration. No grandstanding, no coasting - just two masterful musicians playing together. “The Biology of the Conflict: the Building of the Cognitive Elite Meritocracy Within the Jewish Ghetto, American Society, and Gaza”.